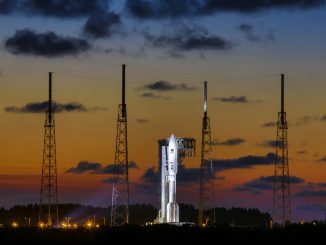 CAPE CANAVERAL — A space-bound NASA satellite was hauled aboard a military transport aircraft from a Southern California factory to the launch site in Florida on Friday and its United Launch Alliance Atlas 5 rocket booster arrived by sea from the manufacturing plant in Alabama today. The Tracking and Data Relay Satellite-M, or TDRS-M, is scheduled for launch Aug. 3 at 9:02 a.m. EDT (1302 GMT) from Cape Canaveral. “The team is getting jazzed,” TDRS Project Manager Dave Littmann said in a phone interview Friday. 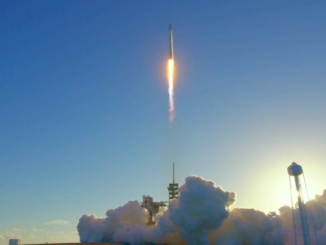 The craft was flown from Boeing’s Satellite Development Center in El Segundo, California, to the Space Coast Regional Airport in Titusville, the town neighboring NASA’s Kennedy Space Center in Florida. 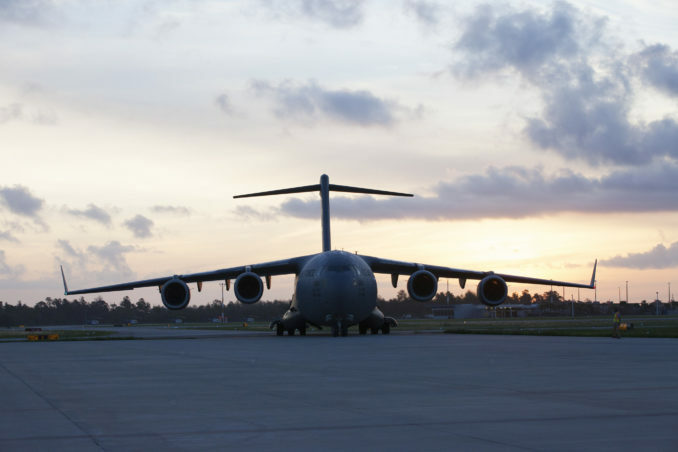 The Boeing C-17 Globemaster III aircraft, operated by Air Mobility Command, flew a red-eye trek from Los Angeles International Airport across the country, touching down in Florida at 6:30 a.m.
Snug in its protective shipping container, the communications spacecraft was taken to the commercial Astrotech payload processing campus for the start of the launch campaign. The satellite will undergo final testing, the loading of its in-space maneuvering fuel and encapsulation the rocket’s nose cone while at Astrotech. 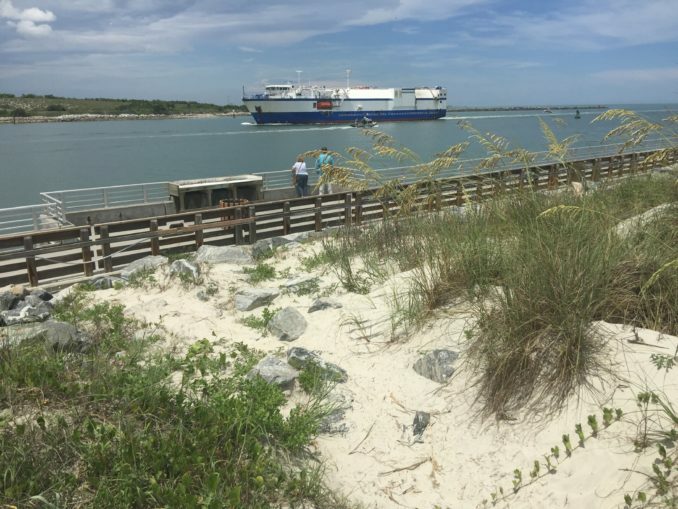 Meanwhile, the ocean-going Delta Mariner cargo ship delivered the Atlas 5’s booster stage and Centaur upper stage to Port Canaveral today after an 8-day journey from ULA’s production factory in Decatur, Alabama. The vessel traversed 270 miles up the Tennessee River, 60 miles on the Ohio River and 646 miles down the Mississippi River. The trek then covered 815 miles through the Gulf of Mexico and around to Florida’s east-central coast to the Cape, arriving at about 2:30 p.m. The two-stage rocket will be stacked aboard the mobile launch platform at the Vertical Integration Facility in the coming weeks. The TDRS-M satellite was built to provide follow-on and replacement capacity to maintain and expand NASA’s Space Network communications infrastructure. Operating from geosynchronous orbit 22,300 miles above Earth, TDRS-M will supply high bandwidth telecommunications services for data-relay and tracking low-Earth orbiting user spacecraft and launch vehicles, including the Hubble Space Telescope, the International Space Station and NASA’s science observatories. 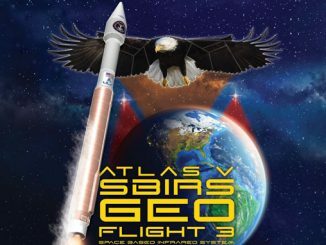 This spacecraft is the third and final built by Boeing under the third generation of TDRS satellites, joining TDRS-K launched in 2013 and TDRS-L in 2014 by the Atlas 5. They are joined in orbit by the Boeing-built TDRS-H, I and J launched in 2000 and 2002 aboard Atlas 2A rockets for the constellation’s second generation. Four of the original generation, built by TRW and launched by space shuttles between 1983 and 1995, remain useful in orbit as well. The TDRS satellites are clustered in three zones — the Atlantic, Pacific and Indian Ocean regions — to cover the entire globe with near-continuous communications. The system was started in 1973 and saw its first satellite launched in 1983 to phase out and replace NASA’s global grid of ground stations that severely limited contact with shuttle missions and unmanned spacecraft. See earlier TDRS-M launch coverage.